Make rice according to package instructions. Once cooked, mix in cilantro, lime juice, lime zest, butter and salt. Set aside. While rice is cooking, saute the vegetables. Heat oil in in large skillet and place over medium heat. Add bell pepper, onion and mushrooms. Saute 8-10 minutes until vegetables have softened. Remove from pan and set aside. Put same pan back on medium-heat and coat with cooking spray. 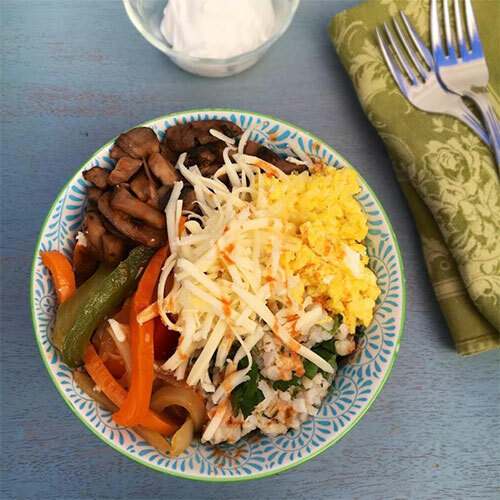 In a small bowl, whisk together eggs, 1 1/2 ounces California cheese, Real California milk and black pepper. Add to hot pan and scramble by stirring eggs fairly consistently until they are cooked through. Remove from heat. To assemble bowls, scoop rice into each bowl. Arrange sauteed vegetables in each bowl next to rice. Add eggs in each bowl next to vegetables. 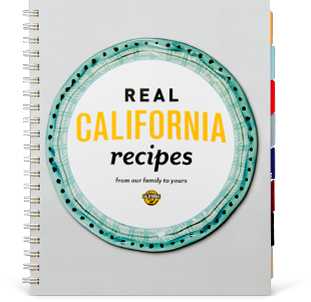 Top each bowl with remaining 1 1/2 ounces California cheese and a dollop of California plan yogurt. Top with hot sauce if desired.